Overall, the region is characterized by an eroded plateau with bedrock overlain by varying thicknesses of loess. Most characteristically, the river valleys are deeply dissected. 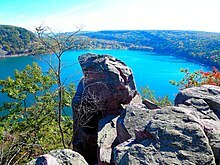 The bluffs lining this reach of the Mississippi River currently climb to nearly 600 feet (180 m). In Minnesota, Pre-Illinoian-age till was probably removed by natural means prior to the deposition of loess. 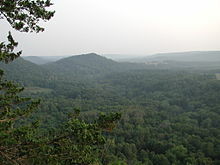 The sedimentary rocks of the valley walls date to the Paleozoic Era and are often covered with colluvium or loess.Bedrock, where not directly exposed, is very near the surface and is composed of "primarily Ordovician dolomite, limestone, and sandstone in Minnesota, with Cambrian sandstone, shale, and dolomite exposed along the valley walls of the Mississippi River." 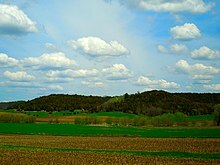 In the east, the Baraboo Range, an ancient, profoundly eroded monadnock in south central Wisconsin, consists primarily of Precambrian quartzite and rhyolite. The area has not undergone much tectonic action, as all the visible layers of sedimentary rock are approximately horizontal.